Because it's a typical day in America, awful anti-abortion legislation has sprouted up to menace women's health and safety. This time, the anti-choice lunacy takes place in Tennessee — where proposed legislation could amend the state constitution in order to give anti-abortion zealots free reign to pass draconian restrictions on women's reproductive health. Just in case you weren't certain that the amendment is both dangerous and completely misogynistic, it makes sure to clarify that women's lives are less important than those of unborn fetuses. Great. Republicans have been trying to pull this crap for fourteen years, ever since the Tennessee Supreme Court sided with Planned Parenthood and the ACLU to block several strict abortion restrictions in favor of increased privacy. But women's privacy, like their health and safety, is trivial to the anti-choice crowd. 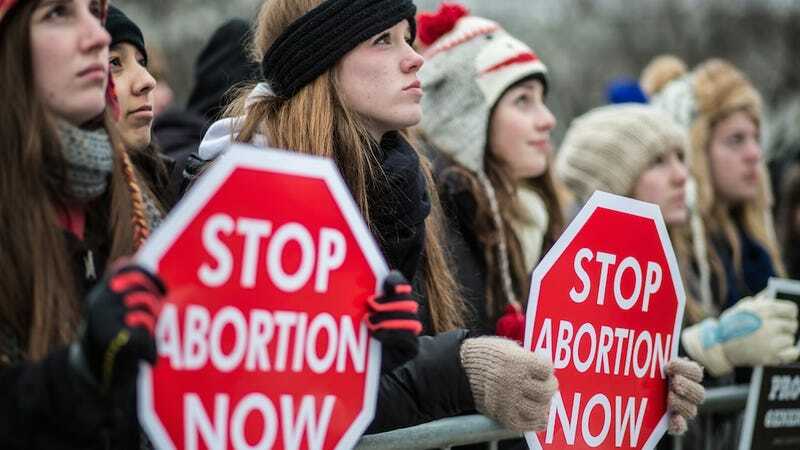 Thus, for years they have endeavored to do everything in their power to force women to carry unwanted pregnancies to term (without technically taking away their constitutional right to abortion). If it succeeds, the amendment will allow Tennessee lawmakers to enact all the horrible laws that have been afflicting neighboring states: they'll be able to intentionally over-regulate clinics out of existence and to institute waiting periods meant to inconvenience women. In the words of Jeff Teague, the president of Planned Parenthood of Middle and East Tennessee: "[The amendment] will basically just open the floodgates for the general assembly to pass any kind of restriction... We think they probably have a long list of things they're going to pass." Such restrictions would have more far-reaching consequences as well. As Molly Redden notes at Mother Jones, 1 in 4 women who receive an abortion in Tennessee come from out of state. Women in the South are rapidly losing abortion access because of insidious anti-choice legislation, so shuttering providers in Tennessee fucks over women in Alabama and Mississippi and Oklahoma, too. If the amendment succeeds, Tennessee women will be put at huge risk — as will women in neighboring states. Restricting abortion access doesn't decrease the frequency of abortion: it just makes it far more likely that women will resort to unsafe or illegal alternatives. Of course, as the legislation's language makes abundantly clear, that's of little concern to Republicans.